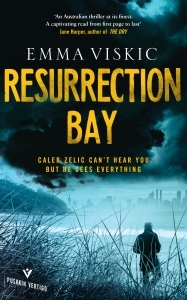 Gutsy, original and with a devilishly tricky plot: ‘Resurrection Bay’, the debut novel crime novel by Australian author Emma Viskic, has a lot going for it, enough in fact to be a hit as soon as it was published in Australia, where it won the 2016 Ned Kelly Award for Best Debut, as well as an unprecedented three Davitt Awards: Best Adult Novel, Best Debut and Readers’ Choice. A novel that pulls no punches, as Viskic doesn’t shy away from tackling issues that, in theory at least, are beyond the customary remit of genre fiction. For example, how we cope with, and relate to, physical disability, not to mention racism, sexism and addiction to alcohol or drugs. Viskic pens an unflinching yet compassionate portrayal of human vulnerability, creating characters that are all to some extent flawed, in mind if not in body. And, crucially, she is not afraid of revealing both the depths down which they can be dragged by their weakness, and the heights to which they can climb. Caleb Zelic was left with seriously impaired hearing after contracting meningitis at the age of five, when he moved with his family to Melbourne, Australia. He is a fighter, but also a man who’s painfully aware of his handicap. In his early thirties, he lives a full life, runs a private investigation business with a partner and was married seven years to beautiful Kat. Yet he still occasionally needs to take cover behind the protective barriers he has erected around his disability since his youth. 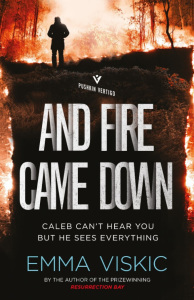 In the novel’s harrowing first chapter, Caleb is the first to arrive at his best friend’s Gary’s house, after Gary sent him a text desperately pleading for help. Caleb gets there too late though: Gary, a happily married father of three and a police officer, has been savagely tortured and murdered. It’s the start of a nightmare for Caleb: Gary was helping him out – in his spare time – with an investigation into a string of warehouse robberies, and Caleb has to accept that there may be a connection between the investigation and Gary’s murder. If there is, it may be an accidental one, but Caleb and his partner Frankie Reynolds, a tough, middle-aged former cop with a history of alcoholism, need to start from that premise as they pursue their investigation. Within 24 hours, Caleb is the target of an attempted murder, Frankie vanishes mysteriously and Kat, Caleb’s ex-wife, to whom he turned for help after being attacked, also appears to be in the killers’ crosshairs. There is no question in Caleb’s mind that Gary’s horrific murder and the warehouse robbery investigation are connected – and the Melbourne police is of the same opinion, to the point they suspect Caleb’s involved in the crimes too. In a dramatic interview with Caleb, they hint that Gary may have been corrupt, and his very strong connection to Caleb, not to mention the fact that Caleb’s estranged brother Anton has a history of drug dealing and was contacted by Gary just before the latter’s death, make Caleb’s own position uncomfortable to say the least. ‘Resurrection Bay’ is as tough and tense a crime novel as any thriller fan could wish for, but it’s the originality of Viskic’s characterisation that makes it truly stand out. Each of the main characters is a fully believable blend of strength and weakness: Caleb’s positive, upbeat outlook is occasionally shadowed by an instinctive reluctance to open up to people, Frankie’s tough-girl bluster barely conceals the scars of a troubled, unlucky life, while Kat is a blend of extroversion and inner fragility – a young Aboriginal Australian woman with two miscarriages and a broken marriage behind her, who strives to develop an artistic career fighting against deeply ingrained racial prejudices. It takes a dose of authorial courage to populate a crime novel with such an interesting mix of fragile, touchingly human characters, yet Viskic does brilliantly in striking the right balance, and in not letting her characters’ originality detract from the enjoyment of her thrilling plot. A plot which is subtly layered and full of well-timed twists: Caleb and Frankie engage on a desperate hunt for Gary’s killers while trying to stay one step ahead of the Melbourne police, some of whom seem to be playing a double game. Theirs is a frantic race to survive within a cruel house of mirrors, in which it becomes increasingly hard to figure out who’s on whose side. Viskic pulls no punches also in a less figurative sense, so there is plenty of action and violence in store as Caleb and Frankie fight to protect themselves and those close to them. Yet the human, and humane, element is always there, subtly sketched by the author’s spare, flawlessly paced writing. Well done Emma Viskic for this stunning crime debut, and we look forward to more!